Hosted in the cozy setting in Marina Square, a couple of bloggers chilled out to lovely gelatos on a lovely Sunday in April, at Alfero Gelato. Alfero Gelato is one of the 16 finalists in the Gelato World Tour's best gelato flavour competition, and that explains my excitement to try it! 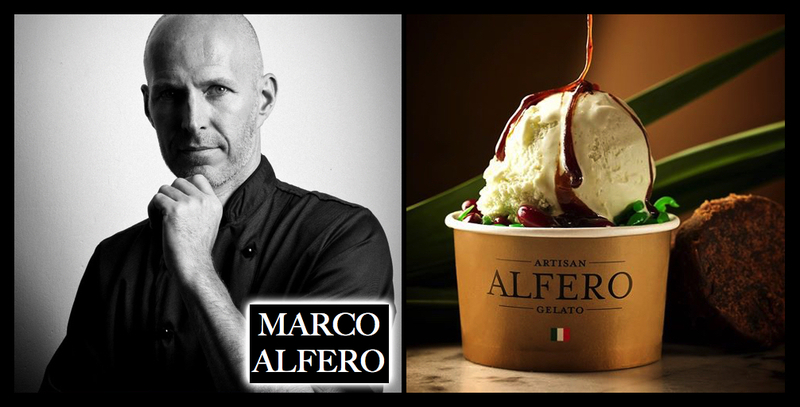 Here's a photo from Alfero Gelato, showing the man behind the gelato brand - Marco Alfero - and his gelato entry for the competition (right). A side note: Many hotels and Italian restaurants place orders for his gelatos as they like its quality and texture! Why are the tubs all closed? There's a special reason. The gelato tubs are kept closed to minimise their contact with air, light and the inconsistent temperatures. This helps to retain the quality of the gelatos. I started off with some hot chocolate. It's really smooth and not even that sweet. It's totally my style of how a good hot chocolate should be. When I tasted this, I knew that the chocolate gelato here was not going to disappoint. For the young ones - he's also done up a pure Milk Gelato flavour to suit the taste buds of children. It's really flavoured with milk, but it was too light for my tastebuds and I would still stick with the other flavoured gelatos. However, the brownie totally didn't make the mark for me, so I will focus on the gelatos instead. Chendol Waffles paired with Chendol Merdeka Gelato! This gelato flavour was also the one which got him into the top 16 in the Best Gelato Flavour Competition. Combining the fragrance of coconut milk, freshly squeezed pandan juice, flavourful gula melaka, velvety red beans and smooth chendol (green starched jelly), Chendol Merdeka Gelato is created to commemorate Singapore’s 50th Birthday, which also explains why the word ‘Merdeka’ is added to the name, and the love for local food by the locals. It was an interesting idea, and the gelato was really lovely! But I personally feel that the waffles should be crispier. Here are the various gelato flavours we tried! My favourite flavours are the pistachio (although I'm not a pistachio person! ), dark chocolate, yuzu, mango and avocado! Be sure to try these flavours when you drop by. Looking from the photo above, were you able to spot the pistachio? No, it's not the cup in the front row, spotting a brighter green. Their pistachio ice cream colour is a slightly dirtier green because there's absolutely no colouring used in his gelatos. Marco sources and imports the ingredients used in his gelatos from Italy. You can be sure that you're getting the best from your 'simple' cup of gelato, as the distinctive ingredients are from the best parts of the country. To put it simply, for example, he'll only import from the place in Italy which spouts best pistachios! So much effort goes into a scoop, and only natural ingredients are used, that's why I love their gelato. Another thing I like about their gelatos are that there's no gum added in the ice-cream, that's why it melts faster than other ice-creams. Finally, my points go to Alfero Gelato as they only sport 2% to 9% fat, as opposed to ice-cream, which has about 18% to 30% fat in it! I'm sure this will be a huge score point for the girls!